If you are super busy, so busy you are starting to worry about how your dog will ever get out of the house for fresh air and the bathroom, you need not worry much longer because the The Wag! app is here to save the day. The new Wag! app can bring on-demand service to dogs and dog owners, and it’s as easy as ordering a pizza or a cab. All you have to do is download the iOS app, and fill out a short profile with your dog’s name, age, breed, notes about his or her personality, and the veterinarian’s name and phone number (optional). Then add a credit-card number, and you are ready. The standard Wag! 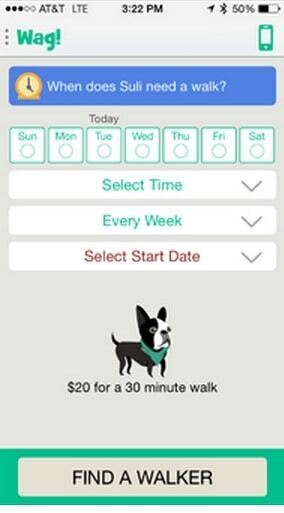 fee is $20 for a one-on-one, 30-minute stroll, though owners can add a second dog for $5. Walks can be scheduled in advance or using a “right now button” anytime from 6 a.m. to 11 p.m., seven days a week. So not only will it take a large amount of stress off of your shoulders it gives young and reliable students the chance to earn some money while at the same time keeping your pet pooch happy, everybody wins!